An amusing story has it that Ian Milliss met his now-wife, Wendy, because she was a keen art historian rummaging through the archives at Sydney University’s Power Institute. Wendy was researching the legacy of conceptual art in Australia, and found a few traces of this rather elusive character, who seemed to have disappeared from the art scene in the mid 1970s. Wendy somehow found some contact details for Ian, and went to visit him, digging through his piles of paperwork for a more detailed version of his role in (and out of) the Australian art world. Besides the very narratable fact that all this librarianship led to romance, one of the things that tickles Ian the most is that a whole lot of his dishevelled paperwork ended up in carefully coded white cardboard folders, like the one pictured above. 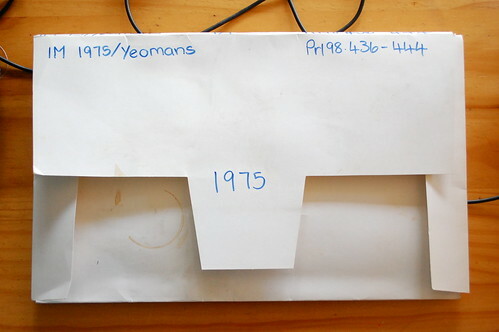 I’m working my way through this, the “IM 1975/Yeomans” folder (aka Pr198.436-444) right now. As to what that complex code could mean, I have no idea, but it does seem to lend some authority to the scraps of paper, carefully wrapped in glassine, inside. (Ian has referred to some of these scraps in a previous post). 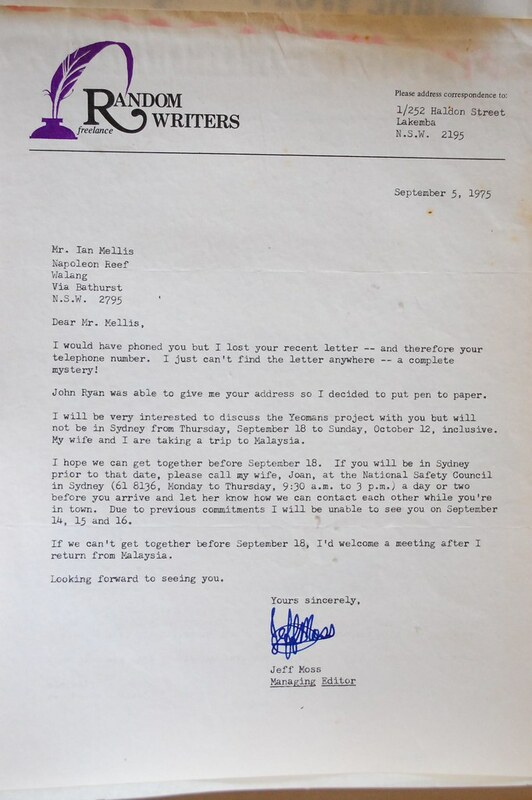 For the moment, I just want to draw attention to this one letter addressed to “Mr Melliss”, from Jeff Moss, the Managing Director of Random Writers. It is unclear as to what kind of arrangement Mr Moss might have had with Mr Melliss. Our only clue: “I will be very interested to discuss the Yeomans project with you but will not be in Sydney from Thursday, September 18 to Sunday, October 12, inclusive. My wife and I are taking a trip to Malaysia”. Anyway, the answer surely is not hard to find. Up in Wallewerang, on t’other side of the Blue Mountains, sits Mr Melliss himself. I’m hoping my posting of the letter here will prompt him to reveal all. If, that is, he can recall! (If not, perhaps Wendy can jog his memory). Well it’s a nice story, and I would be happy to leave it at that, but in the name of art historical accuracy that won’t do unfortunately. I was actually employed as a researcher on an ARC large grant into the origins of conceptual art in the UK, Australia and New Zealand. Ian was one of the artists I was ‘investigating’ and probably the most forthcoming if you know what I mean. I interviewed him and he corrected his own transcript, adding approximately another 30,000 words, and then I sorted through about 2000 bits of paper and assorted works of art. I tried to make sense of them by providing a context/chronography, entered the works into a very basic database, that I set up with the help of ‘databases for dummies’ not knowing at the time that he was also a professional database developer…..shook the mould off all those papers which had been stored for yonks under his mother’s house, put them into clean envelopes AND THEN wrote a thesis on ‘deconstructing the database’. After that I decided to keep him. BTW, the letters are quite easy to decipher. With the help of ‘cataloguing for dummies’ I duly designated the name of the institution, thus prl is Power Research Library, 1998 with the number of the work following. I made up various categories, of which Yeomans is probably the most straight forward. Easy. To tell you the truth I can’t remember. I don’t think I ever had a meeting with him because it was around this time it all got called off. Personally I think the best thing about the letter is the Mellis bit. These days people mis-hear my name as Willis but then it was Mellis. The infamous Wally Mellish, possibly the greatest deal maker in Australian history, was still fresh in people’s minds back then. His memory can still bring guffaws of delight to older Sydney siders. Lucas of course wasn’t born then so he missed this. In 1968 Wally took a potshot at the the police who arrived at his Glenfield house to question him about stolen car parts. They surrounded the house ready for a good old style shootout then discovered his girlfriend Beryl Muddle and baby were inside. The police commissioner, the notoriously corrupt and inept Norm Allen, took control of the operation. When he went in to negotiate he ended up as a hostage himself. One of Wally’s demands was that Beryl marry him so Norm Allen was witness as well as supplying the ring and a takeaway curry wedding dinner. He also provided the already well armed Wally with an army armalite assault rifle and 200 rounds of ammunition as a good will present. The siege continued for two weeks with Wally making constant calls to talk back radio to chat about how it was all going. Eventually as everyone including himself was getting bored he made a deal to give himself up on condition he could join the army and go to Vietnam and all charges including shooting at the cops were to be dropped. They took him to the army camp where he apparently failed the intelligence test (go figure!) and was then shipped off to psych hospital. Everyone had been enormously entertained and the only real damage was to Norm Allen’s already abysmal reputation. One interesting sidelight (given that Lucas and I just spent the weekend involved in the Woolloomooloo and Victoria Street Green Ban Art Walks) is that Allen put detective Don Fergusson in charge. Fergusson was associated with the tabloid celebrity cop Ray “Gunner” Kelly whose ostentatiously corrupt activities included an abortion extortion racket allegedly with Fergusson as the bagman. Fergusson later made a spectacular exit by “committing suicide” in the CIB toilets in 1970. Shooting himself twice was a nice touch. In fact it is claimed he was killed by his former offsider Fred Krahe because he had some principles and wouldn’t take drug money. Krahe then worked with organised crime figures Lenny McPherson and Abe Saffron and for the developer Frank Theeman in Victoria Street. As a member of the group fighting Theeman’s development I was always highly aware of Krahe’s reputation for extreme violence and we were probably rather foolhardy in standing up to him. Apart from large scale systematic intimidation, bashings and kidnapping a group member he was ultimately allegedly responsible for organising the murder of Juanita Neilsen, the last remaining Victoria Street campaigner. Oh well, if nothing else, I guess the letterhead “Random Writers” was a prophesy, thirty five years ahead of its time, for this blog post and its subsequent comments! I suppose I should add that I did actually google Jeff Moss and Random Writers a few weeks back and found nothing of use. Obviously we were going to talk because he seems to have been writing a book about Yeomans, in fact what little I can remember is that I think Yeomans himself put me on to him, but that’s all.